Got a unique solution or monolithic substance that is no longer virgin grade? Maybe you have a tote / drum of a material that has started to drip on a pallet of your storage room? Did you conduct a frequent survey of your storage rooms only to find the person responsible for a chemical is no longer employed? These factors make identification of a sample chemical a legal requirement. For it is with this identification of the chemical components that a safe and environmentally friendly recycle or disposal option may be found. When a sample must be sent to a certified analytical laboratory, aside from using the proper container, it has to be manifested correctly and shipped by an authorized shipping vendor such as FedEx. 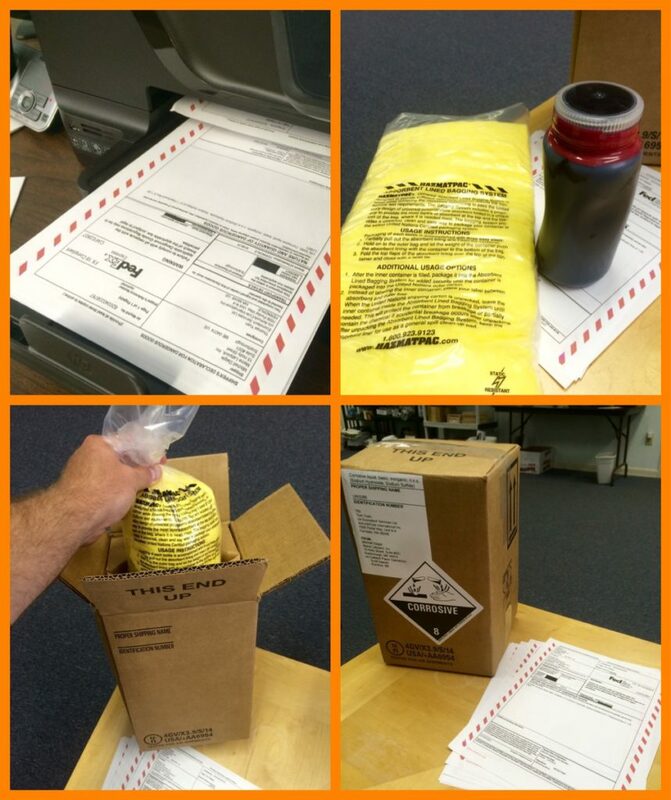 Many components go into the new Hazardous Materials, and Dangerous Goods (DG) shipping guidelines. Over many years, the international community has come together with the aid of the federal government to mandate changes to containers, paperwork, labeling procedures, and Chain-of Custody, all for insuring the safety of personnel and the responsible disposal of the chemicals in question. International Air Transport Association IATA, while founded in Havana, Cuba, 1945, is responsible for leading the charge in proper packaging for chemicals in the air. Many aviation related accidents are the result of chemicals that reacted with its surroundings, which led to the death of people and destruction of property. One recent disaster pointed to batteries that caught on fire. Some of our customers pay us a fee to take the headache out of the precision that must go with this exercise. It is very easy for one company employee to take as long as 4-8 hours to accomplish this task. Failure to complete any of these in exact accordance of IATA Regulations, and FedEx will send you packing (with your sample still under your arm). Why deal with that headache? We are trained to accomplish this task frequently and can save you time and money. We may even guarantee you a perfect delivery of your sample to FedEx. When that specialty waste profiling request comes up, or you need to ship a sample to headquarters in Germany, call MLi Environmental to make this process seamless and headache free. Watch our series of posts coming up on why we take this matter seriously and how to get your samples shipped the first time, every time.